This agreement is a comprehensive, detailed agreement between you, the foreclosure cleanup business owner, and the subcontractor(s) you choose to hire to perform work for your company. The Foreclosure Cleanup Industry's Subcontracting Agreement is a comprehensive, detailed agreement between you, the foreclosure cleanup business owner, and the subcontractor(s) you choose to hire to perform work for your company. As a foreclosure cleanup business owner, you should have this detailed agreement on file for each and every subcontractor you hire. And the agreement's simple, fill-in-the-blank format allows you to print it as often as necessary, over and over again, so you can have a separate agreement on file for each subcontractor. 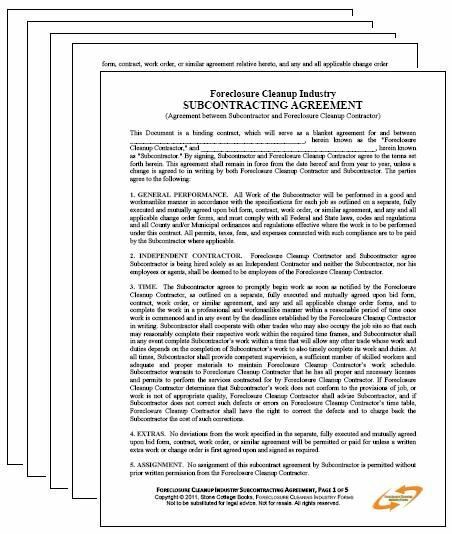 The Foreclosure Cleanup Industry's Subcontracting Agreement is the only one of its kind on the market; it was designed specifically for the foreclosure cleanup industry. This 5-page agreement assures you will solicit the necessary information and signatures to protect you, your company, and your customers as you grow your foreclosure business. Start growing your business by hiring subcontractors to perform the duties you either don't have the equipment to handle, are too busy to handle, or choose not to handle. Increase your bottom-line this year by utilizing the services of qualified subcontractors that can complete various aspects of your foreclosure cleanup jobs as you concentrate on bringing in more business. A vital industry tool for business growth. Visit the premier site on the web for everything you need to start a successful foreclosure clean up business.